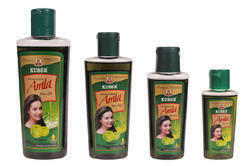 Made up of Sesame Oil and helps in delaying premature graying of hair, to be used by 35+ women (SEC- B and lower). • Composition :- Light Liquid Paraffin Oil, Coconut oil, Herbs Almond oil, Amla Extract, Preservative Perfume. - Pleasantly fragrant and non-greasy hair oil which gives beautiful aroma to hair throughout the day. - Made from natural herbs in a traditional way. Ayurglow‘s Amla Brahmi Herbal Hair Oil formulated With the goodness of Amla, Brahmi, Bhringraj, Triphala, Fenugreek & Hibiscus leaves helps control dandruff and hairfall, and nourishes the hair, preventing split ends and dryness. Massage well into scalp and hair. Wash off with a gentle herbal shampoo.